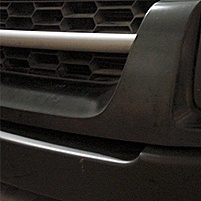 Why Turtle Wax black chrome will not be your best solution; find out what is! A long time favorite is no more! 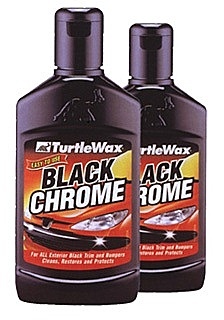 Turtle Wax black chrome remains at the top of search lists for many die-hard fans of this popular black trim enhancer and restorer. Turtle Wax is synonymous with car care and remains popular among car enthusiasts and car owners in general. My research has suggested that many people go in search of this product from Turtle Wax with the attempt to find the latest in specially formulated car waxes. Not only is Black Chrome not a car wax product at all, but it is no longer available here in the United States. If you are looking for a long time favorite of yours by way of this product, you will forced to a frustrating search via the Internet in attempts to track this product down. But with that said, not only do alternatives exist to Turtle Wax Black Chrome, but alternatives that are formulated using superior advances in chemical engineering! There isn't an area of life that has not been improved through advances in both chemical engineering and manufacturing. 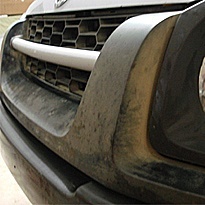 Cosmetic car care is no exception. But old habits die a long painful death, as we are naturally resistant to change at any level. But if you ever want to experience the benefits of advanced chemical engineering, you will be required to release the old habits of brand recognition, to the world of professional level auto detailing products. Professional products, for professional results! As a professional auto detailer I can tell you I have never come across any other professional detailer using Turtle Wax products within their business. As consumers, we are often left choosing among inferior products that have been "watered down" or even "dumbed down" in the name of corporate profits, or the proverbial "cover our asses" mentality that is engineered in to virtually every other retail product meant to feed the masses. Many people think that professional grade detail products are only for the professionals to be had. The good news is that as a car owner or enthusiast, you can enjoy true professional grade products. When it comes to enhancing and restoring all your exterior black trim pieces on your car, alternatives do exist that promise to deliver superior results to your retail products that you are likely to be currently using. As can be seen in these dramatic pictures, these professional grade black trim restoration products represent the latest in technology with chemical engineering in restoring and enhancing black vinyl trim pieces on your car or truck. Top rated retail trim restorer. Most popular trim restorer on Amazon. A simple as simple gets for most people looking to simply restore their car trim. A trusted name in cosmetic car care. This product will be black in color (very different than the Black Wow below), and will be what you might call an actual dye for black trim. It literally infuses the black trim with the black dye. As permanent as permanent gets. Long lasting; withstands repeated washings and rain. One of the actual black trim restoration products I use professionally. If you are looking to produce professional grade results you gonna have to cut the cord from your Turtle Wax black chrome. Let go of the past try Black Wow by itself, or with the complete black trim restoration kit below. For truly dramatic results, I recommend the Black Wow cleaner and restorer kit below. It is what I have been using for years and the product continues to "wow" my customers. Mass produced black/gray plastic trim pieces are inferior in nature as compared to high-tech plastics and polymer based products that can be found in other markets such as firearms, aeronautical, marine, etc. The mass produced black trim pieces on cars are formulated with added impurities and additives to make them "cheaper" to mass produce. These additives and impurities will forever oxidize or bleed out. 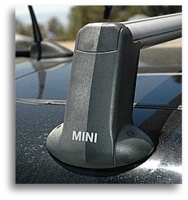 Because of this, you will always be fighting against the inferior trim pieces that are inherently inferior. Both products above are as permanent as you are going to get, unless you were to actually paint the black trim pieces on your car/truck. Both products above are great and professional grade. You will not be disappointed. But every tool and product has its own unique "personality" that will reveal itself as you use them. For this reason I carry both with me professionally, and simply choose from moment to moment which one I decide to use. It would be hard to know exactly which product is "best" since each black trim piece itself will be completely unique to another black trim piece. In the end; don't over-think it. Just pick one and go with it. You will get amazing results. Of course we can't forget that as far as I can tell; Turtle Wax black chrome doesn't even exist any longer! The age old adage of "Old habits die hard" applies to car care products just as much as any other area of life. But just like every other area of life, technology has also made car care much easier. Now you can not only get better end results, but doing so is also easier than ever! So ditch the Turtle Wax black chrome, and go with professional!